As technology has moved to the forefront of the bike fitting landscape, old-school bike fitters like me who still blend art and science, now appear to be the fitting “underground”. What’s the correct approach towards melding modern technology, the expert eye, and experience in getting the best fit? 1. Standard Fitting Studio Set-Up: Today, almost every bike store has a spot in the back with a trainer and a wheel block where a client’s bike can be set up for a fitting. Hanging on the wall is a goniometer and plumb bob and a few tools that help measure inseam and torso length. The client mounts their bike, pedals it, and then has to stop for these instruments to be used to measure the position. This is called a static fit. 2. High Tech Fitting Studio Set-Up: In addition to typically already having everything the “old school” studio has, the new high tech fit studio consist of a dynamic fit bike and/or a motion capture system. SpinScan is part of the CompuTrainer system, and is an electronic Pedal Stroke Analyzer that can help increase power and efficiency. The software is able to show the left and right leg power splits and gives the rider feedback needed to pedal in "circles". It identifies "flat" or "dead" spots in the pedal stroke where power is not being transferred to the drive train and is a great tool to help during the fitting process. Motion Capture Systems: Retul is currently the most well known in 3-D motion capture using a marker based optical tracking system. It tracks infrared light (IR) emitted by an 8 point body harness worn by the rider that has light-emitting-diodes (LEDs). This cycling-specific 3D motion capture system reads a rider's movements (knee angle, back angle etc.) while pedaling and records all three planes of movement (3D) in real-time. Retül's dynamic fit tools allow a bike fitter to make fast and easy adjustments to a rider's position using objective and highly accurate fit measurements to guide the changes. Dynamic Fit Bike: The “fit bike” or “fitting machine” is the evolution of the mechanical fit bikes (ex:Waterford, Serotta) and replace the stationary trainer and client’s bike. Instead of being fit on your own bike, we install your saddle, similar sized bar and pedals on the fit bike which you then ride during the fitting process. The beauty of these fitting machines is that they allow a rider’s position to be changed while pedaling (dynamic state) with accurate adjustments (up/down, forward/backward) of the saddle and handlebar. Some examples of these are DFU, Retul MOVE and Guru Fit Bike. While they essentially do the same thing, the way they operate can differ. Most fitting machines have the option to be out-fitted with a power meter. The addition of SpinScan used during a dynamic bike fit provides additional means to remove guesswork out of the bike fit process. Pippo Pozzato working on his time trial position earlier this year. To accurately capture what this means to you, the reader, I have asked Stu Waring, a Master Retul fitter and instructor, his thoughts on the advantages and disadvantages of old-school vs. high tech. Initially trained by me in my PowerFiTTE methodology, he currently uses a Guru Dynamic Fit Bike and Retul as tools for all of his fittings. I consider him the person most knowledgeable to discuss the merits of both approaches. Some of this discussion is basic, some of it digs deep into bike fitting minutia. JH: Hey Stu, hand fitters appear to have been unceremoniously swept to the curb by a tech savvy, effectively marketed array of glitzy technology. Have the “hands-on” fitters become anachronisms of a dying culture? Or just in need of better tools like the CompuTrainer SpinScan that essentially measures the fluid dynamics of the pedal stroke? Share some of your thoughts both pros and cons of ‘Tech vs Hand’. SW: Well John, the main advantage in using a Fit Bike is that we can make adjustments to the rider’s position in a dynamic state. Traditionally, adjustments using the client’s bike can only be made in a static state. The rider had to stop pedaling and lift off the saddle or get off the bike while adjustments are made. The DFU that I use allows me to save multiple positions and quickly revert back and forth with a click of the mouse. With a hand fit it’s impossible to go back to another position without tearing the bike apart, which takes time. In regards to measuring the rider’s position, the biggest variable with static fitting is that the fitter is required to stop the rider and position the foot at the bottom of the stroke to measure the knee angle. The hand fitter has to set the foot and therefore is putting the rider in a position which the fitter perceives as the most desirable and not likely what the rider actually pedals. This leaves the door wide open for inaccuracy. Retul measures the ankle angle and knee angle at the same time dynamically allowing for the best position to be attained for the rider. JH: OK, but with a good eye, an experienced hand fitter watching the pedal stroke can do the same thing right? SW: I would have agreed until I saw how Retul works. Now I feel it is at best a good guess and not accurate. JH: I agree replication of foot angles are important; we use a separate goniometer just to check the angle and a laser to measure the consistency of the angle. I believe my method is also accurate. I train my cyclists to pedal at 17-20 degrees of plantar flexion for maximum, consistent output. Another strong point concerns sacral alignment which we check before measuring the leg angle. SW: Like you, we are constantly looking and communicating with the rider during the entire process. This is something that you instilled in me years ago and is a big part of my process. JH: OK, we agree on visual observation. Next point – with the simplicity of a telescopic goniometer, I can check the body’s trigger-point markers to get it right quickly, then back test the results with Computrainer’s SpinScan technology. SW: Yes, it is hard to argue about the cost and simplicity of the goniometer, it is a classic and every fitter will always have one. A point on SS, it does not capture the entire stroke, it measures the torque output and calculates the information it provides on the first 180 degrees (down stroke) for each side. JH: You are right it’s a calculated representation, but it reads directly off the tire edge and the physics are spot on. Actually nothing is better, with load being calculated at 100 times per second. SW: The Computrainer and SpinScan are great tools and I use both too, and most fit bikes come standard with one. Retul adds the ability of literally drawing the path of the knee during the entire pedal stroke. JH: It appears we both use similar methods to accomplish the same end result. Certainly Retul offers the data as back up, but essentially it does not change the output of the fit. As for other elements of the positioning, it’s important to take notes and use body markers. We both are only looking for one position, the right one for that individual at that particular time. SW: The downside of any Fit Bike/motion capture combination is it is expensive to purchase and is permanently installed. The Computrainer is very inexpensive by comparison, can be stored in a closet and is mobile. The Fit Bike is time consuming to use since the final position has to be transferred from the fit bike back to the owner’s bike. However this only has to be done one time and can save time especially when dealing with multiple bar and stem changes. The Computrainer saves time since all of the changes are made directly to the owner’s bike. However this can backfire when working on the cockpit and more than one stem and bar change is required. JH: Agreed on all points. SW: With our system we are able to provide accurate electronic data capture throughout the fitting that can be e-filed for each customer. The final position can be used to help determine the correct size and set up for a new bike purchase. With the Computrainer the position capture is made by hand, is time consuming and might not be as accurate. JH: I’m mesmerized by the amount of data produced by your Retul system. SW: If and when there is a problem or imbalance, the data is there to help determine the cause. Most of the time we only use a small amount of the data, but when there is a red flag we have options and plenty of data to fall back on. JH: I’m not sure all that information is necessary. I’m dubious about its value to the athlete who really just needs to know a few documented position markers for replication, and whether or not he/she has improved power and comfort. SW: Truthfully I was skeptical too, until I started to use it. Now I find it invaluable. Now that I’ve seen the technology in action and the benefits the data can provide, it’s hard to go back. It boils down to this: dynamic vs. static data capture; measure the rider while they are pedaling or stationary. The answer is obvious. 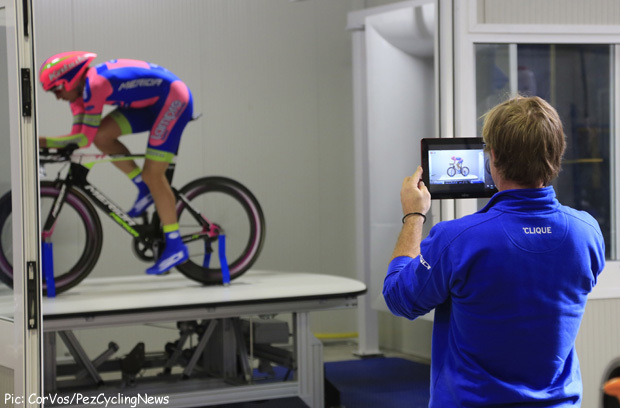 Retul is simply a better tool because it allows motion-based rider data capture. I call it a “liquid tape measure” because it provides the ability to capture data accurately and quickly while the rider is pedaling. Hand tools cannot do this. They require the rider to be in a motionless state. The addition of a Fit Bike provides the opportunity to increase accuracy of bike data capture by being able to adjust the position in a dynamic state. The bike on a trainer requires the rider to stop for an adjustment. What you do with the data is completely dependent on your ability and experience as a fitter. Neither of these tools creates a position for you, they only capture data and allow easy adjustment. You still have to know how to fit someone and to listen to them. When it comes to the determining the correct position, Retul and Fit Bike don’t do it for you. You have to spend time with the client to determine their physical constraints and limitations, so “Hands-on” fitting is still a major part of determining the fitting solution. Personal interaction develops trust and confidence between fitter and the client. No amount of technology will ever replace the human aspect of a fitting. JH: Bike fitting is a SERVICE, not a technology or a product. While technology can potentially makes fits better, we both agree that it is still up to the fitter and his/her experience level to determine what to do with the data. This has been a good exchange of thoughts, ideas and views. You have done a great job of expressing your position and you are right - technology is here to stay, but from this exchange I think we are achieving similar results, but taking a slightly different approach to get there. SW: I would hope that you agree John that looking at this from a broader perspective, that these tools allow fitters to see things they might otherwise miss and or take years to spot? JH: I would acknowledge that it’s not realistic to expect everyone to have the depth of experience that we have cultivated. New fitters and those with experience need to understand the importance of accuracy and repeatability, developing a quick diagnostic eye rather than missing details and taking years of trial and error learning. Thanks for ‘listening in’ to our conversation. In the next two installments, I will share with you the key reasons why you might consider a bike fit, the questions you should consider asking of any prospective bike fit practitioner, and finally, what can be done to enable your body (through procedures like Dynamic Motion Therapy) to perform ‘Faster, Higher, Stronger’ more effectively than by just turning bolts or changing parts on your bike. I want to thank Ralph Walker, CEO of John Howard Performance Sports for his timely input and editing of this piece. John Howard is one of the pioneers and true legends of American bike racing with palmares including: 3-time Olympian, Ironman world champion, bicycle landspeed record, USA Cycling Hall of Fame, and elite and masters national champion. John is also an active cycling coach and the author of Mastering Cycling. Check out more information about John and his coaching at www.fittesystem.com and www.johnhowardsports.com.